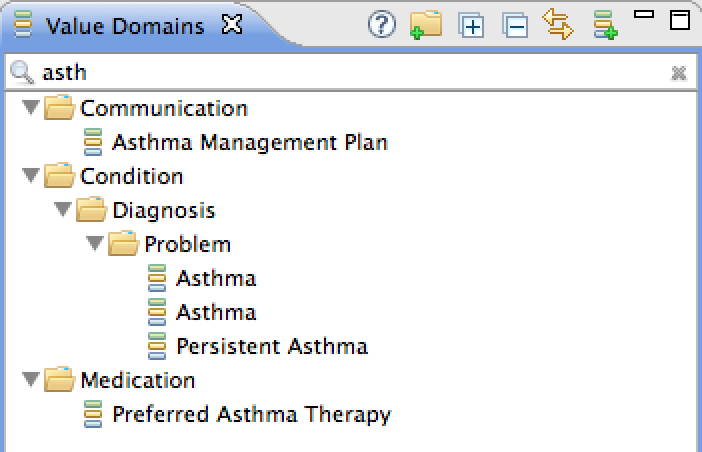 Open the value domains perspective by clicking on the respective button in the toolbar. If you want to use a different perspective you can open the value domains view from the main menu: Window > Show View > Other > Snow Owl > Value Domains. Value domains are organised by category. Categories can be expanded and collapsed . You can link the value domain editor to the value domain view with the button. 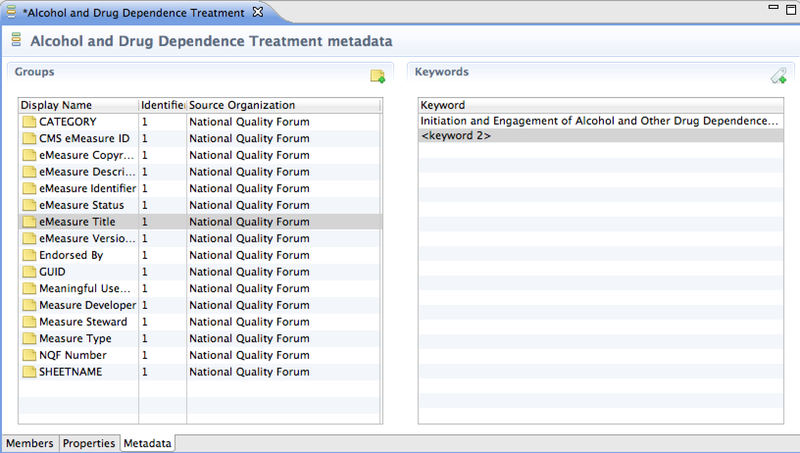 A filter allows to search for value domains. To create a new value domain click on Add new value domain in the view's toolbar. Alternatively you can right-click on the parent folder and select Add new value domain from the context menu. On the first page of the wizard, you have to specify the following mandatory text fields. Name: Enter the name of the value domain. Definition: Enter a definition describing how concepts in the value domain were selected. Purpose: You can enter a brief description about the general purpose. Reason for inactivation: This only applies if the status is set to inactive. Type: Intensional, extensional, expanded, or grouping. Source: Identify the originator or publisher of the information (e.g. your organization). Source URI: Enter the URL or document URI that provides further details regarding the value domain. Comments: You can enter additional information about the value domain. Click Finish to proceed, and enter a commit comment. 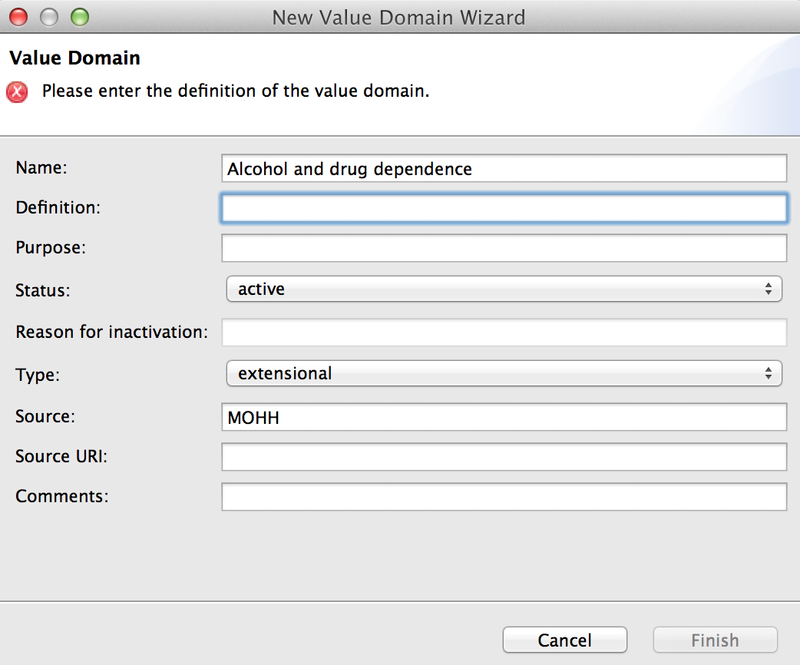 The new value domain is now displayed in the value domain view, the editor is automatically opened. To delete a value domain right-click it in the view and chose Delete value domain from the context menu. Confirm the deletion plan, and enter a commit comment. Importing and exporting value domains is discussed in the Importing, exporting and publishing section. 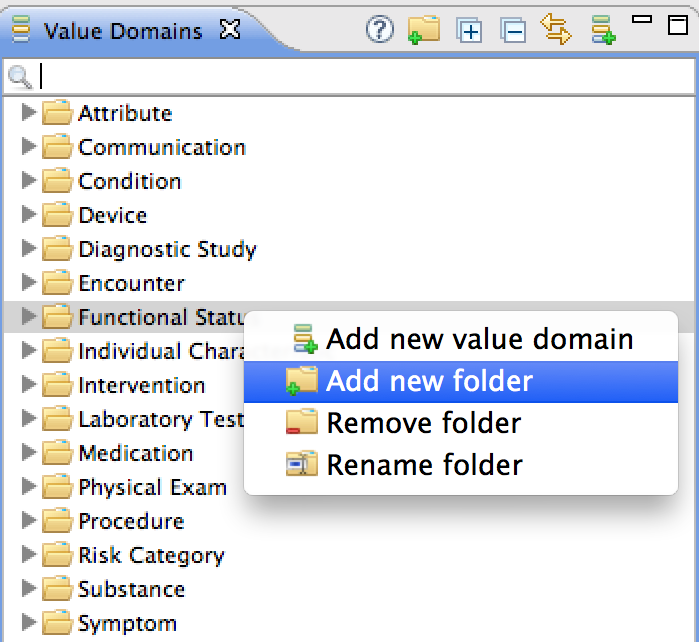 Value domains can be organized in folders and subfolders. You can also use the context menu to remove and rename folders. If you want to move a value domain simply drag and drop it from one folder to another. Double click-a value domain in the view to open the value domain editor. The editor consists of three tabs: Members, Properties, and Metadata. Term: The name of the member. Code: The unique identifier of the member. Status: Displays if a member is active or inactive. The status can be changed by clicking the cell. Code system name: Refers to the terminology or local code system that was used. Code system version: Version of the terminology or local code system that was used. Code system ID: Object Identifier of the terminology or local code system. Effective time: Unpublished, or publication date of value domain membership. Usage: You can enter information about the use of the member here. Comments: You can enter additional notes about the member here. A toggle button allows switching the view between hierarchical and flat list modes. The clock button allows to show or hide inactive members. You can sort the content by clicking on the header of the column. Double-clicking a member opens the respective editor. The hierarchical view is similar to the concept navigators. Terminologies are organized in separate folders and can be easily distinguished by their icons. Click on a node to expand or collapse the tree, double-click a concept to open it in the editor. The minus button in the toolbar closes all nodes. New value domain members can be added from the different terminology views or from the search results. Search results: Mark the result you want to add and drag it into the value domain editor. If you want to add all search results, use the shortcut CTRL+A to mark all results, then drag them into the editor. To add only selected results, press CDM and click the result you want to add. Save. Terminology views: Go to a terminology view (e.g. ATC view), mark the concept or code you want to add, and drag it into the value domain editor. Alternatively, you can right-click a concept and select Add concept to the active value domain. 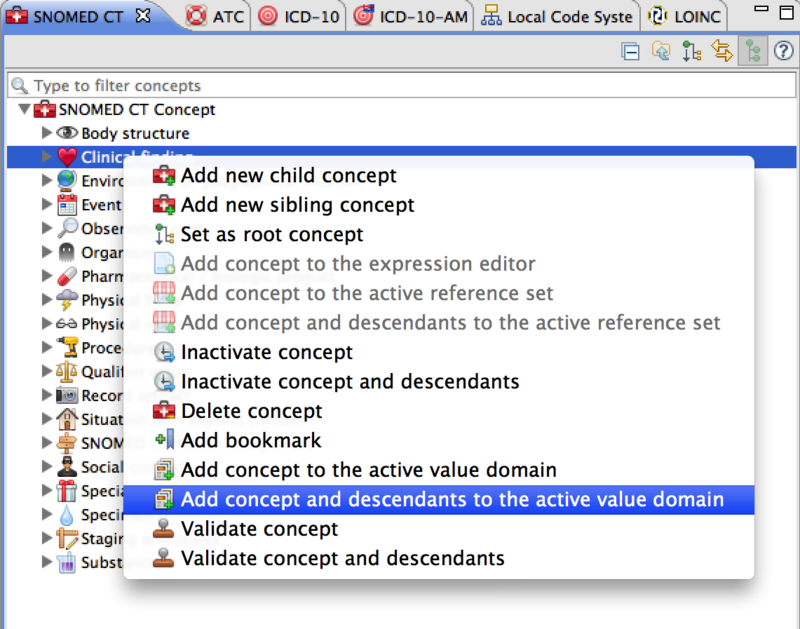 To add multiple concept select Add concept and descendants to the active value domain from the context menu. A warning dialog will inform you if you are trying to add a member that already exists in the value domain. Use the context menu to remove or inactivate selected members by right-clicking on the member/members. The button in the view's toolbar allows to show or hide inactive members. If you select an inactive member, the context menu will display an option for activating the selected member. Alternatively, you can activate or inactivate members by clicking on the respective cell in the table. Additional information about the value domain (e.g. definition) can be entered on the properties tab. You can also modify existing information. Name: The name of the value domain. Definition: Text definition describing how concepts in the value domain were selected. Purpose: Brief description about the general purpose can be entered. Version: A string identifying the specific version of the value domain. Reason for inactivation: If the status is changed to inactive, a reason has to be specified here. Source: Source of the value domain, identifying the originator or publisher of the information. Source URI: URL or document URI that provides further details regarding the value domain. Comments: Additional information about the value domain can be entered here. To define a keyword, use the botton in the toolbar , a default text (e.g keyword 2) will appear in the table. You can enter your keyword by overwriting the default text. You can also create a new keyword by right-clicking on the table, and selecting Add new keyword. Members pointing to missing concepts are allowed with a warning. A small question mark decorator indicates that these concepts have not been imported. The reason for inactivation has to be specified when the status of a value domain is changed to inactive.